In the daily grind of family and friend life, it’s easy to lose track of dishes that get left behind after parties (potlucks, baby and bridal showers: I’m talking to you). A quick and easy solution is to write the name of the owner on the dish itself; then when you’re ready, you just deliver the borrowed dish, and cross it off your to-do list. 2. WRITING VISUAL REMINDERS String around your finger not working so well for you? Use WGW to leave visual reminders where you need them most: remembering that you’re out of milk (or making an as-it-happens grocery list) has never been easier than putting your list right on the fridge. Working late? Leave instructions for the first person home to get dinner ready, and add peace of mind to the nightly routine. 3. LEAVING LOVE NOTES There’s nothing lovelier than happening upon a little love letter to start your day. Use WGW to leave your sweetie, your kids…or yourself, a special note on the bathroom mirror to tell them how much they are loved. Someone has an important meeting or test coming up today? Why not draw a speech bubble coming out of where their mouth will be in their mirrored reflection - what better way to get pumped for success than by brushing your teeth and seeing that yeah, “I’ve got this!” 4. ORGANIZING PANTRY ITEMS Even the most particular pickler can lose track of what’s what in the winter pantry. WGW is an easy (and beautiful) way to label jars of this year’s jams and sauces, with no awkward sticky residue to deal with later. Use it to pretty-up jars in your baking cupboard, particularly for all those powdery ingredients that look the same - you’ll never add salt instead of sugar again! 5. PERSONALIZING PLATES It’s always the little finishing details that can make the biggest impression. Make your guests feel extra special by labelling their dinner plates with names, or a quirky little guide to dining (think: always start with the smallest fork first!) Get conversation started with a thoughtful touch for everyone around the table. Bonus! 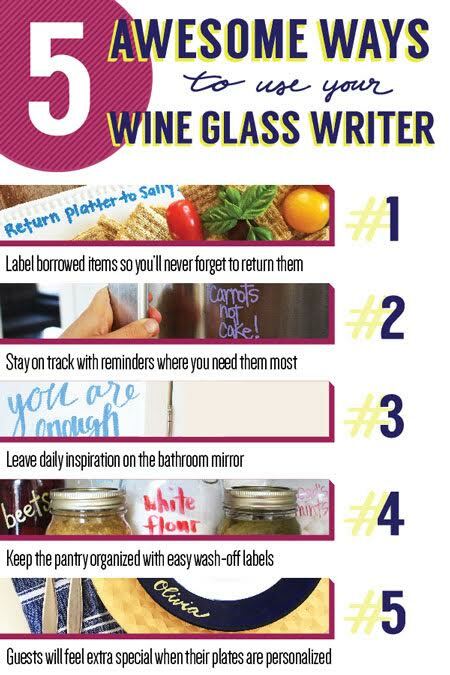 3 Funny + Crazy Ways to Use Your WGW 1. 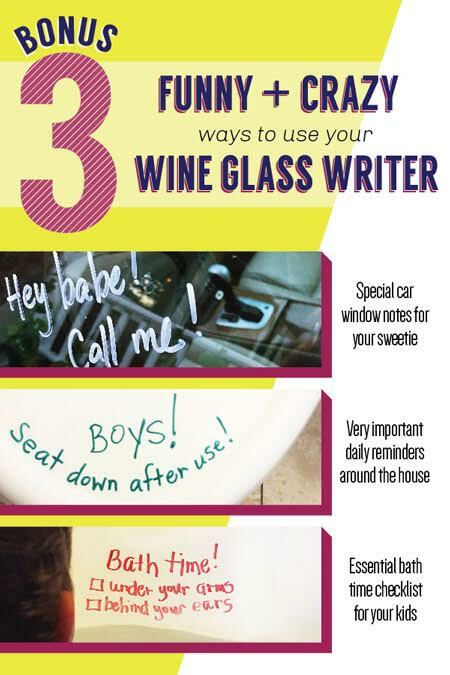 CAR NOTES Write a flirty message for your sweetie (or the tall drink of water you’re pretty sure just made eyes with you from across the paring lot) on the driver’s side window - make their day with a little extra love! 2. DAILY REMINDERS Sometimes the message really is the medium: if saying the same darn thing over and over isn’t getting through, then maybe a “don’t forget to flush!” note on a certain porcelain surface will get results. 3. ESSENTIAL CHECKLISTS Say good bye to bed time drama with a nightly check list: something cute and easy like “Brush, flush, wash” is a great way to help kids participate in the process without being constantly reminded over and over.